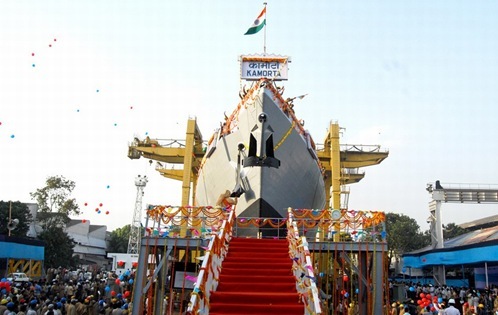 Garden Reach Shipbuilders and Engineers (GRSE), Kolkata launched ‘Kamorta’ the first Anti Submarine Warfare Corvette (ASWC) for the Indian Navy on April 19. 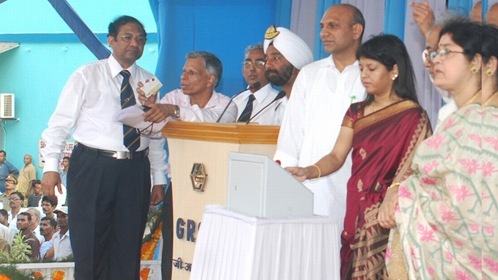 The event coincides with Golden Jubilee Anniversary celebrations of GRSE. Kamorta signifies an island, in the Andaman and Nicobar group of islands. Launched by Smt. Mamatha M, wife of the Minister of State of Defence, Shri M.M. Pallam Raju. Stealth corvette (Yard 3017), the first of the series of four under construction as Project 28. Expected to be commissioned by mid-2012. Three remaining corvettes are also under construction and are expected to be inducted into the Indian Navy by early 2015. Equipped with the latest indigenously developed Sonar to detect submarines, torpedo tubes, Improvised Rocket Launchers (IRL) and scutter (torpedo decoys) launchers. Has a very low signature of radiated underwater noise. Smt. Mamatha M wife of the Minister of State of Defence, Shri M.M. Pallam Raju launching the Kamorta, First Anti Submarine Warfare Corvette built at GRSE, Kolkata. Read more from Sakaal Times.